There are times in your life when you are lucky to witness a special achievement. I have been extremely blessed over my professional career to be a part of some amazing success stories. To this day, I still experience goose bumps when I reflect on some of these momentous achievements I have been able to witness here at home. In Australia, we hear a lot about the achievements of our sporting hero’s and superstars in the media which are all phenomenal achievements, however, as a society, we hear less about the amazing stories that are going on in our local communities, literally in our backyard that are happening everyday. I would like you all to meet Lainie Carter, a dear friend and long term client of mine. She has been gracious and kind, giving me permission to share her story. I like to call it “just keep swimming” because essentially, that’s what Lainie has done. She just kept on going, even when the odds were stacked up against her, she just kept on going until she reached her happy destination. I first met Lainie 4 years ago. She was referred to me by a mutual friend for exercise advice. Lainie had tried numerous diets from the age of 12. She had always been active and played years of netball and enjoyed the active lifestyle. In 2006, Lainie was suffering from PTSD symptoms and put on 45kg in six months. 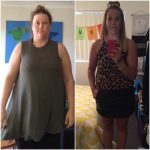 To offset the PTSD and weight gain, she tried medications, counselling, gyms, swimming, aqua aerobics, cycling, triathlons and literally every diet under the sun. These all provided short term solutions, however, Lainie continued to yo-yo with her weight. 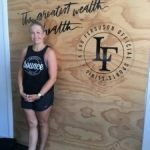 As part of Lainie’s exercise plan back 2013, she took up CrossFit and lost 10kg in 6 months. She loved the community support CrossFit provided and the ability to scale workouts as she needed. She was eating better, taking the 80/20 approach to balancing out food choices. But then, another set back occurred; she was diagnosed with arthritis in both her knees. Due to the pain she was experiencing in general everyday life, she ceased all activity as her flare ups were excruciating. Over the next few months, Lainie’s depression took over, her weight increased and she was on a lot of medications to offset the depression. 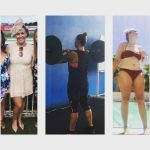 Lainie was battling clinical depression, anxiety and emotional eating and her exercise schedule was sporadic, being shared between weightlifting, walking and the occasional swim. About 15 months ago, Lainie made the brave decision to seek medical help and move forward with weight loss surgery. Taking on this decision meant that 90% of her stomach would be removed in a procedure called a “Verical Sleeve Gastrectomy”. But two months before the surgery, her inner demons got the better of her, turning to food for emotional support, she put on 14kg. Lainie, you are a inspiring, happy, kind, caring and nurturing soul. Your mental strength through all of this showed resilience in difficult times but on the surface you remained positive and compassionate. I can’t wait to see what the next 12 months has install for you; who knows, maybe even the Noosa Tri could be ticked off that “Bucket List”??. Thank you for letting me share your story and thank you for all your support as one of my clients, committed to being the best version of yourself. I know your story will help, inspire and give confidence to others experiencing similar inner demons to “just keep swimming” until they find their happy destination.